With the start of grilling season coming upon us (I’m from the midwest so we say “grill out” but you might call it a barbecue), I wanted to share an easy side dish to any grilled dinner. We make it just about every time we grill out. Its really versatile and you can add anything you want to it. The best part is that you only need 5 ingredients for the basic cheesy potatoes. So judging by the ingredients list, you can probably already tell that this recipe is not very scientific and mostly just based on how much you want to make and how cheesy you want the potatoes. Start small and you can always make more if you feel like there’s not enough. I find that 5 lbs of potatoes makes about 4-5 pouches (we’ll get to those in a bit). Start by using a cheese grater to shred the potatoes. Once you are done shredding, set them aside soaking in some water. Tear off 4-5 sheets of aluminum foil about 10-12 inches long. Spray them VERY well (they will stick if you don’t give it a good coat) with cooking spray. 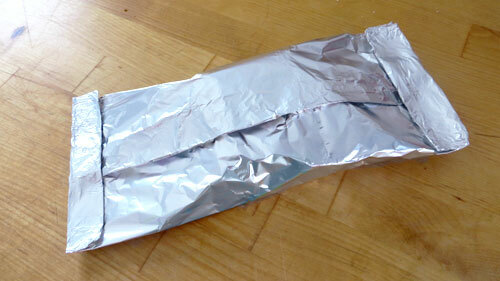 Add a handful of potatoes to the center of the foil, 1-2 cups depending on how big your foil is. Give a good sprinkle of salt and pepper along with about a tablespoon, more or less, of onion. Toss that by hand to distribute the salt, pepper and onion. Top with a small handful of cheese (more or less to your liking). Now all you have to do is grill them. If you like them to be a little crunchy, leave them on longer. Cooking time will depend on your grill and how hot it is. I would say about 15-20 minutes (make sure to flip them half way through). Alternatively, you could use frozen hash browns from the store and thaw them or if you want small cubes you can do that too. Its all up to your particular taste. Some foods go better with the diced variety with some veggies like steaks while I enjoy putting the shredded potatoes on my hot dogs and smoked sausages. You can also add peppers and greens if you want some different flavors in there. I have also done sweet potatoes this way (sans cheese) and they are pretty amazing. Don’t be afraid to experiment with this a little because it is such a simple recipe and it would be hard to make a bad batch! This entry was posted in Recipes/Tutorials and tagged blogger, cheesy potatoes, grilled, grilled food, recipe, recipes, side dish. Bookmark the permalink. ← Bump day week 16!